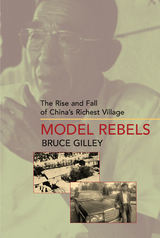 A portentous tale of rural rebellion unfolds in Bruce Gilley's moving chronicle of a village on the northern China plains during the post-1978 economic reform era. Gilley examines how Daqiu Village, led by Yu Zuomin, a charismatic Communist Party secretary and president of the local industrial conglomerate, became the richest village in China and a model for the rural reforms of the 1980s and early 1990s. A growing campaign of political resistance led to increasing tensions between the villagers and the Chinese state, and eventually, in an event that made headlines around the world, an armed confrontation between the village and higher authorities backed by paramilitary police brought Yu Zuomin and his village crashing down. Bruce Gilley is a contributing editor to the Far Eastern Economic Review in Hong Kong and the author of Tiger on the Brink: Jiang Zemin and China's New Elite (California, 1998).